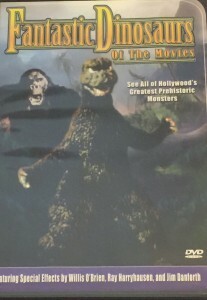 Fantastic Dinosaurs of the Movies is a bit of a hodgepodge. The bulk of the running time is devoted to old movie trailers, but the first fifteen minutes or so is kind of all over the place. Things get off to a cool start with the Goodtimes logo being projected on an old school TV with a top-loading VCR. The TV turns on and we are treated to a brief segment in which stop-motion movie theater patrons watch clips of old dinosaurs movies. Then a narrator gives us some factual information about dinosaurs using clips from such films as Gertie the Dinosaur, The Lost World, and Godzilla as illustrations. The coolest part though is the vintage behind the scenes documentary of Ray Harryhausen hard at work on The Golden Voyage of Sinbad. In addition to seeing Harryhausen working on the monsters (along with clips of some of his coolest monsters), we get to see snippets of John Phillip Law and Caroline Munro filming live on location. When she’s not busy filming, Munro takes some time to do some cheesecake photo shoots on the beach, and let me just say… GROWL! From then on, the flick becomes just another trailer compilation. Many of the movies wound up on Mystery Science Theater 3000, so fans of MST3K will probably get a kick out of it. If I’m being perfectly honest, the flick plays fast and loose with the whole dinosaur theme. Sure, there are plenty of dinosaurs on hand, but the compilation is padded out with lots of giant spiders, squids, and bugs. A more honest title would’ve been Fantastic Monsters of the Movies. I’m not complaining though because this collection gives you a nice balance of special effects from stop-motion to men in bad rubber suits to forced perspective pet reptiles. I mean how can you complain when you get trailers for Journey to the Beginning of Time, The Lost World (1960), King Dinosaur, The Giant Behemoth, Earth vs. the Spider, The Giant Gila Monster, The Loch Ness Horror (“At last, the world’s most treasured story comes to the screen!”), The Land That Time Forgot, Jack the Giant Killer, It Came from Beneath the Sea, Them, Valley of the Dragons, Godzilla, King of the Monsters, The Giant Claw, Tarantula, 20 Million Miles to Earth, Godzilla vs. Mothra, Journey to the Center of the Earth, The Crater Lake Monster, The 7th Voyage of Sinbad, Rodan, The Beast from 20,000 Fathoms, Reptilicus, The Land Unknown, Jason and the Argonauts, Ghidrah the Three-Headed Monster, At the Earth’s Core, Valley of Gwangi, Gorgo, King Kong, Son of Kong, King Kong vs. Godzilla, One Million Years B.C., and When Dinosaurs Ruled the Earth. Join us next time on It Came from the Thrift Store when our movie will be Almost Human!